Hey there, and welcome to the third installment of our Year of Beef series! 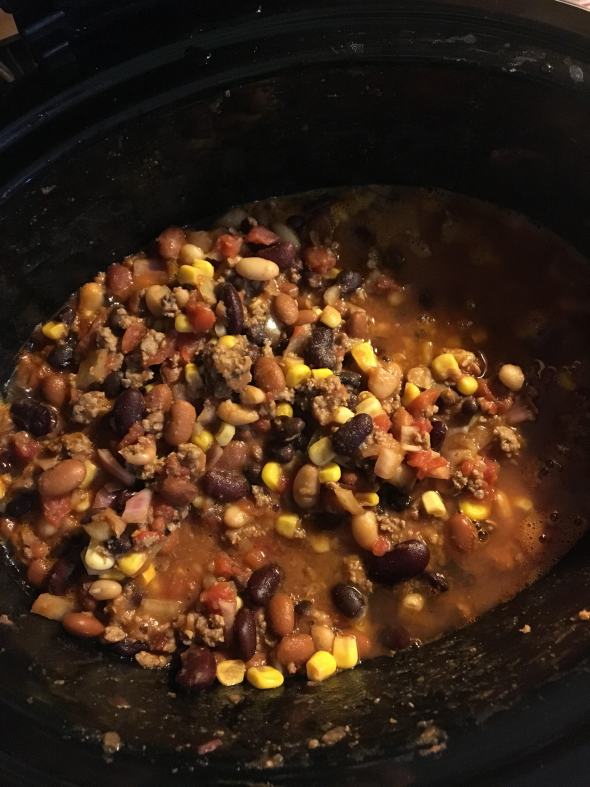 I was planning on making this chili for lunch, but that didn’t end up happening how I had envisioned it. After breakfast I went up to the ranch to finish our year-end books, thinking it wouldn’t take long and I’d be home in time to throw everything in the Crockpot for a couple of hours. But books turned into hauling off dead limbs, and dead limbs turned into calving out a heifer. Justin and I ended up getting home at 11:55, which left me with just enough time to throw some things in the microwave before Noon. Aren’t these just the cutest calves you’ve ever seen? 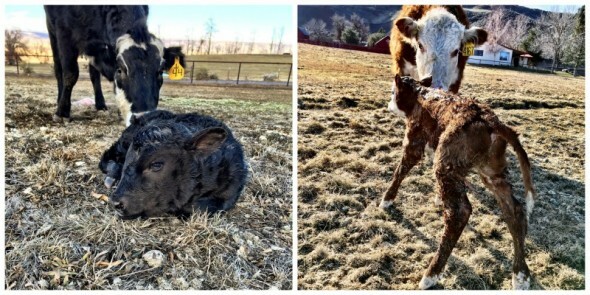 So far we’ve had one bull and one heifer, and have been blessed with such great mommas. Right after lunch I started working on this chili. It didn’t take me too long to throw it all together, and get back to doing things on the ranch! 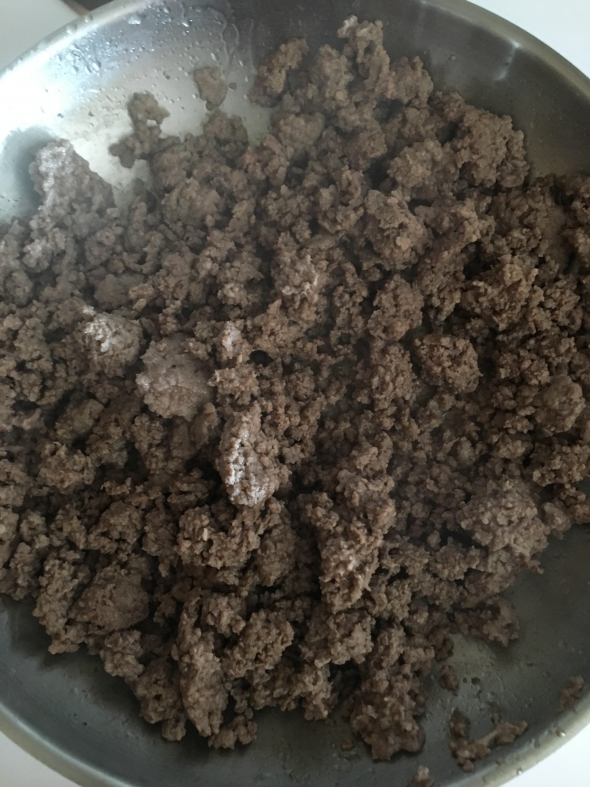 First, I went through the process of browning my hamburger. We had our butcher grind everything pretty lean, which made for very little fat to drain off. I’m a big time proponent of lean beef—nothing can compare to its protein-packed flavor! 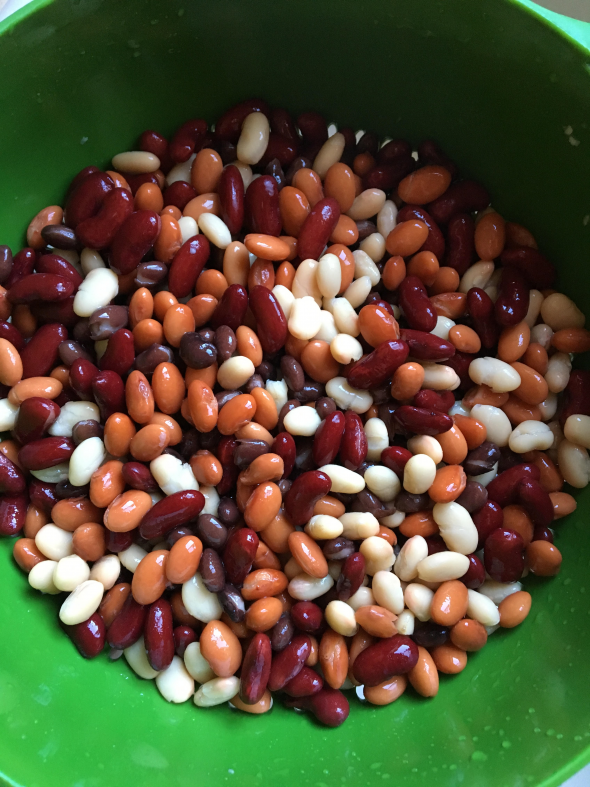 While the hamburger was browning, I dumped all four cans of beans into a strainer, draining and rinsing them prior to putting them into the slow cooker. I also chopped up both onions, and added them in; along with the barbeque sauce, Worcestershire sauce, and Frank’s Buffalo Sauce. After the hamburger was browned (about 7-10 minutes), I added it to the pot, closed the lid, and set it to cook on low for 3 hours. Whenever I’d get a chance to come inside I’d open the lid and stir things around, just to make sure everything got mixed in. Here’s my reasoning as to why I consider the beef broth to be optional. Personally, I prefer my chili to be thick and hearty. As the combination of beef, beans, corn and sauce cooks, you’ll notice that a good amount of liquid starts to make itself known (as you can see in the picture below). After it’s stirred in, the mixture creates the perfect blend of chili—not too thick, but not too runny. That being said, there are people who prefer chili to be more in the form of a soup. If you’re one of those individuals, I suggest adding in one can of beef broth, to give the mixture a little bit of added moisture as it cooks. It was a beautiful day, so while this was cooking I went up and helped the guys with our afternoon feeding. Because of that, I didn’t get a chance to make cornbread like I promised—but I’ll be sure to add it to another recipe down the road. My cornbread probably wouldn’t have had a very big dent in it, because there was a good 15 minutes where Justin and I dipped our chili straight out of the Crock-Pot with some tortilla chips. Not sanitary, I know. 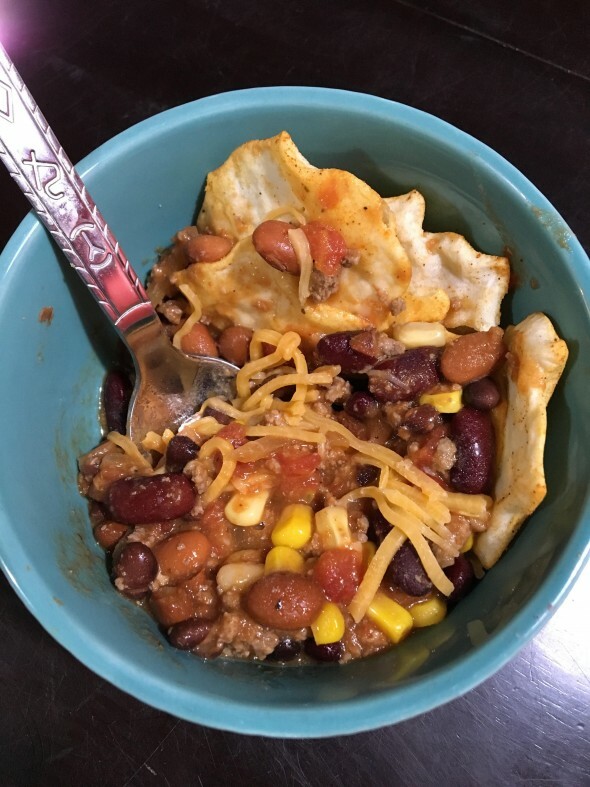 When it was actually time for dinner, I threw my scoop of chili in with a little fat free cheddar cheese and some of my favorite Quest-brand barbecue chips, to give it a little extra flavor. For all you little health nuts out there (myself included)…this recipe is the perfect blend of fat, carbohydrates, and protein; making it a balanced meal that’ll not only fuel your body, but keep you full for a long period of time. Next week I’m cooking up a Blade Roast—so if you’ve got any delicious recipes, be sure to send them our way! 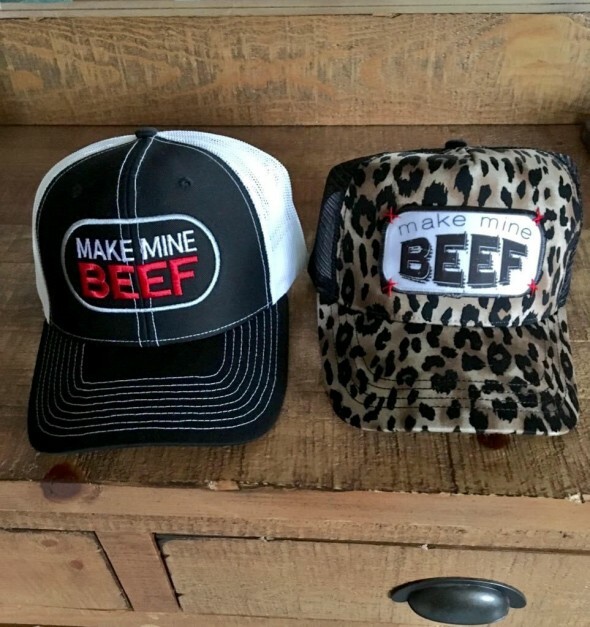 And if you haven’t heard, we’re giving away two of these fun “Make Mine Beef” caps, so don’t forget to subscribe to our posts for a chance to win!